« To Be or Not To Be…Valentine Pink. That is the Question. Pocahontas Grain Elevator II prints are available in three sizes: Small (Limited Edition, 10" W x ~12.3" H, $25). Grand (Limited Edition, ~ 17.9" W x 22" H, $50). Largest (20" W x ~24.5" H, same size as the original). Click photo to enlarge. The November 10th, 2009, Des Moines Register included an article about Mother’s (Marion Gunderson) watercolors and the Rolfe, Iowa, 1980-81 oral history project. * Published alongside that article was a photo of Mother. Also included with that article was this post’s photo (at left) of one of Mother’s painted-in-1949 watercolors of the Pocahontas, Iowa, grain elevator. Enticed by that Register article, including the image of Mother’s grain elevator watercolor, Mike and Sally Hood of West Des Moines attended the open house. After the open house I remembered Mike’s telling of his first-hand story of the 1948 or 1949 construction of that same Pocahontas, Iowa, grain elevator. At my request, Mike was generous to pen that story and allow me to post it here. It was exciting to be a little boy perhaps 8 or 9 years old in Pocahontas, Iowa, in the summer of 1948 or 1949 when they were building the huge concrete silos** to enlarge and modernize the main grain elevator in town. It was particularly exciting for me because my Uncle W. B. Linnan was supplying all of the concrete from his Ready-Mix plant on the east edge of town for this structure. (The Ready-Mix plant still stands much as it was then!) Also, two older cousins, brothers Jim and Frank Linnan, who were college students at the University of Iowa, were living with us and working on this project, which was a very good paying job with good hourly wages and, of course, long hours. I remember that once they started pouring concrete for the grain silos, they had to continue nonstop until it was completed. They used slip forms that were jacked upward and were filled with wet concrete as the construction progressed. As I recall, my cousins worked long 12-hour shifts and walked home from work to our farm. For now, to quickly learn how (or to refresh your memory) the slip forms to which Mike referred were/are used to construct concrete grain elevators, please watch this 33-second YouTube video. * This oral history project was spearheaded by Mother. ** The silos to which Mike referred are the silos painted twice by Mother in the 1940s. 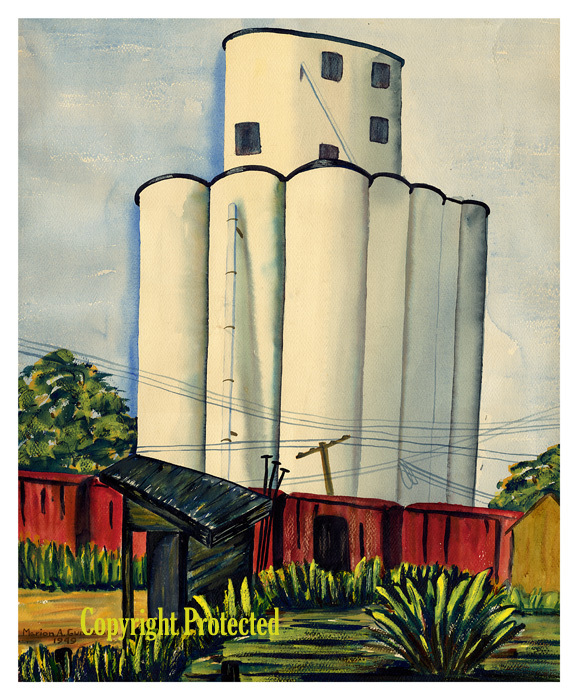 This entry was posted on February 16, 2010 at 3:19 pm and is filed under Grain Elevator, Iowa, Marion Gunderson, Pocahontas, Pocahontas Grain Elevator II, Watercolor image. You can follow any responses to this entry through the RSS 2.0 feed. You can skip to the end and leave a response. Pinging is currently not allowed.